Inspired by the promise of surety and a commitment towards safety, the Seguro features an auto-sensing Touch Stop Functionality. Every time it senses human touch on the grill its blades stop and go into sleep mode for 6 seconds. This unique feature makes the Air Circulator Child-proof, where safety for you family comes first. Its Foot Operated switch, conveniently allows you to control the fan without bending down. Seguro features and auto-sensing Touch Stop functionality. Every time it senses human touch on the grill, its blades stop and go into sleep mode for 6 seconds. This unique feature makes the Air Circulator Child-proof, where safety for your family comes first. Equipped with an Ionizer to keep you home pollen, door and dust-free. The ioniser purifies the air by electrically charging the surrounding air molecules. Helping people suffering from respiratory-related ailments like asthma and dust / pollen allergies. The Breeze we enjoy in natural environs is relaxing because it is undulating in nature. Wind mode mimics natural breeze by smoothly altering the blade speed creating a unique and calming environment for your relaxation. Specially designed five blades are crafted with care to spread air consistently all around the space and surroundings. Five blades make the air flow more smoothly and quietly to create a more pleasing environment. 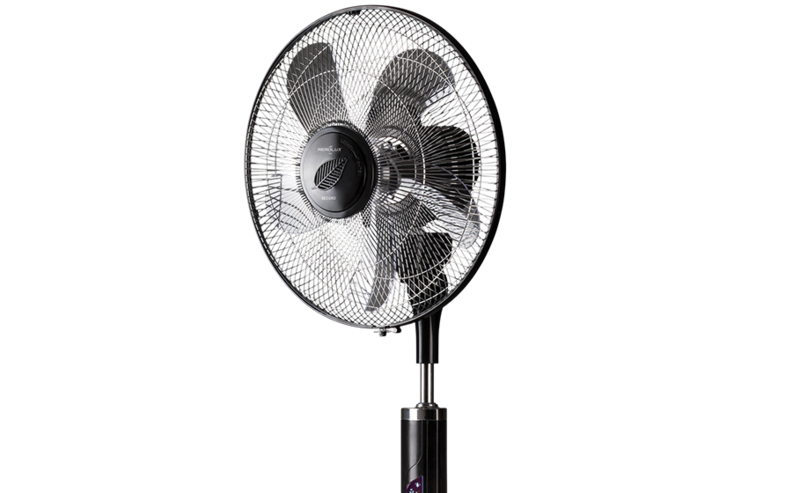 The ergonomically places Foot Switch at the base of the fan allows users to conveniently control the fan, without bending down. Control the various elements of the fan with ease from a comfortable distance. The fan is capable of oscillating both horizontally and vertically, allowing it to cool air widely at different angles and height levels. Its central disk can be used as an aromatise-herb holder, to keep ambience natural, fresh and pleasant. Set auto switched-off time to save energy in the night while you are sleeping.